In medium bowl, mix cornmeal, flour, sugar, salt, baking powder and red pepper. Stir in milk and egg with whisk until well blended. In deep fryer or 3-quart heavy saucepan, heat 3 inches oil to 375°F. Dip each sausage in batter, allowing excess to drip off. Fry sausages, in batches, in hot oil 2 to 3 minutes or until golden brown. Drain on paper towels. Insert pointed ends of sticks into sausages. Serve warm with ketchup and mustard for dipping. For best results, use a long-handled fork for dipping these sausages in the batter and dropping them in the hot oil. 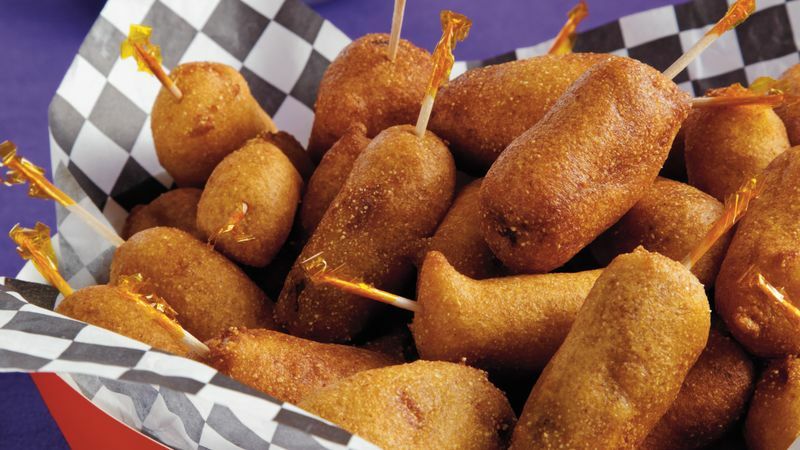 Make these mini corn dogs as an appetizer for a kids' party.